Season has been very successful for the 2019 Jfk tennis team. Many games cancelled due to weather conditions. Team putting in a lot of work even though the weather conditions try to stop them. 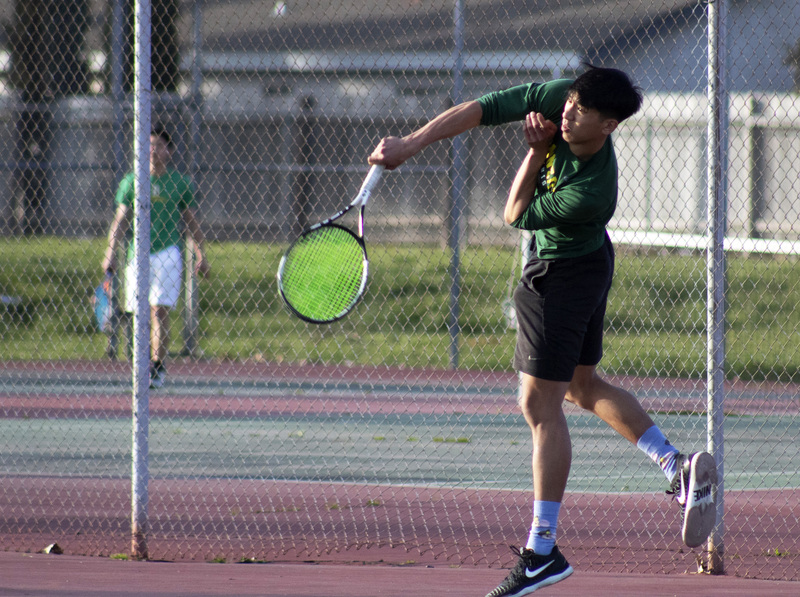 John F. Kennedy’s boys varsity tennis team finished their last season with a respectable record of 8-6, and during this rainy season they have already improved their win/loss record with a tally of 6-3. “The team is really excellent this year. We have a very experienced group that works well together,” says the JFK’s tennis coach, Coach Parsh. Coach Parsh’s words proved right, John F. Kennedy’s tennis team won their first game against Valley High School, and the final score reported 6-2. They also defeated Christian Brothers on home turf, in their second match. After the loss to McClatchy, JFK’s tennis team bounced back, and won their next two games. JFK won against Monterey Trail with the final score of 7-2, and Laguna Creek, with the final score of 6-3. Their two game win streak was broken by River City with many close matches, ending with a score of 5-4. After a rain cancellation, JFK’s tennis team came back strong with a win against Burbank with the final score of 8-1. Kennedy fell short of defeating their rival McClatchy in the next match but the matchup against Monterey Trail proved favorable for Kennedy as they won with the final score of 7-2. “We expect that this year’s team will be successful. There are some very good teams in the Metro League, so it will be extremely competitive. We have an excellent chance of making the team playoffs, which would be an outstanding milestone to reach,” Coach Parsh states. Chemistry is very important to the productivity of the team because each player can understand each other’s strength and weaknesses. “This is one of the most cohesive groups that we’ve had at JFK. They are hardworking and cooperative,” says Coach Parsh. The tennis team have a great chance of making playoffs with these great players.